​In this series of books the author has no intention of trying to add what is a very well documented history as well researched texts elsewhere. He hopes to give an impression of the battlefield through the battles aftermath as seen in the camera lens of normal German soldiers, and not the professional PK cameramen who's well posed shots are will known and have been seen by most interested parties by now. The images in the book were taken by individual soldiers tht show a more personal view. These are views that interested the common soldier and not the professional propoganderist. For the most part these photographs have been part of private collections and have only recently come on the market. Most images used here were taken from prints made on old German Agfa paper stock and most were originally no more than 25 mm by 45 mm in size. "Operation dynamo", The Dunkirk evacuation 26th May to 4th of June 1940. The necessity for the evacuation of the BEF (British Expeditionary Force) has been a matter of controversy for many years and has divided opinion among historians down party lines since the evacuation itself. The author's general view is tht mistakes were made on all the Allied sides - British, French and Belgian. Senior officers stuck in the thinking of the first world war failed to grasp the concept of mobile warfare and were simply outwitted and out-maneuvered by the German's concept of Blitzkrieg (Lightning War). The Allies fell for the German diersionary attack which thrust into Holland and advanced their forces into northern Belgium to stop the advancing Germans. Meanwhile, the main German thrust came through the Ardennes region of Southern Belgium and Northern France, going around the northern end of the French Maginot line which had not been place along the Belgium border for fear of upseting the Belgians. The French had left only second line units in the Ardennes region and these failed completely to stop the German advance. It was these French forces that formed the southern flank of the Allied armies and with this flanks disintegration becoming a full blown rout the British had French forces to the north that had to retreat back to protect themselves from being surrounded and cut off from any means of re-supply. As the German Southern Army Group moved further west into France they moved faster than the Allies retreated and turned north to cut the Allies off. At this point, the one major British counter attack was put into place and on the 21st May the attack was made in the area around the town of Arras against German units commanded by Erwin Rommel. The counter attack very nearly succeeded as it caught the Germans by surprise and only Rommel utilizing his 88 mm anti-aircrft guns in an anti-tank role at the last minute stopped the British attack. As the German attack proceeded, the French morale became extremely low in many units and indeed within their own government. This lead the British High Command to believe that France was a lost cause. Many French units surrendered in mass. However, a few did stand and fight extremely bravely. Indeed the French 2nde Light Mechanized Division and the 68th Infantry Division, fighting with the British 51st Highland Division formed the rear guard that held the Germans at bay right until the final evacuations took place. The British tried to retreat to a port, but Boulogne had already fallen and Calais was already under attack and was not expected to be held. So the port of Dunkirk became the only option to evacuate any of the army back to England and enable them to defend Britain against what was thought to be Hitler's obvious next move - the invasion of the British Isles. This book is by Stratus, who is located in Sandomierz, Poland. They are associated with Mushroom Model Publications (MMP) based in the UK. All of MMP's books are printed by Stratus in English. Stratus also does their own line of books in both English and Polish. This book was sent to me from Stratus in Poland in a bubble lined manila envelope with a second book that is one named "Operation Dynamo, Dunkirk 1940" and is like a children's color book. I will review this later here. The book is soft cover of 88 pages in 8 1/2" x 12" page format. The cover art shows a black and white photo of the beach at Dunkirk after the evacuation. There is a destroyed ship in the water and a grave with a British helmet on it and a abandoned Boyes anti-tank rifle in the foreground. The back cover has cover arts of 4 other books in the Camera On series: Sd.Kfz. 6, Sd.Kfz. 7, German Horse Power, Horse-drawn Elements of the German Army and Sd.Kfz. 10. 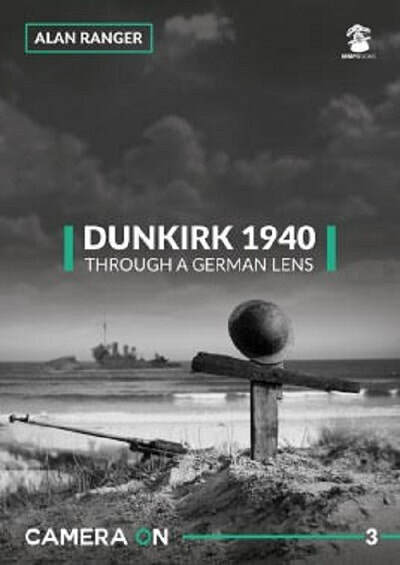 The book contains: 1 map of the Dunkirk area, 48 photos of destroyed ships, one photo of Dunkirk's harbor entrance, 27 photos of abandoned Allied equipment, a photo of an abandoned British 40 mm Bofors gun, 4 photos of Allied graveyards, 34 photos of downtown Dunkirk, a photo of large cranes at the harbor, abandoned vehicles of a British A13 tank (2 photos), British Vickers Light Tank Mk. VIB (9 photos), a British "Matilda" Mk. II tank, a French Hotchkiss H39 Light Infantry tank, British Universal Carrier (2 photos), a French AMC 33 Light Tank, a French Lorraigne Schlepper, a British Bedford 15 cwt truck, road signs, a British artillery unit, a British Morris Quad ammo carrier. Photos of destroyed aircraft include: a British Fairey Battle, a British Bristol Blenheim Mk. I, a British Bristol Blenheim Mk. IV, a British Spitfire Mk. I, a British Hawker Hurricane Mk. I (2 pictures). There are 15 photos of Allied prisoners. This is a neat picture album loaded with black and white photos of the aftermath of the evacuation. I want to thank the folks at Stratus in Sandomierz, Poland that sent me this book and Roger Wallsgrove Editor-in-Chief of Mushroom Model Publications (MMP) in the UK for this review sample.